Over 1000 competitors travelled to the East. 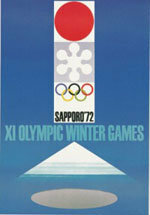 The Sapporo Olympics were the first Winter Games in Asia. Over 1000 competitors from 35 countries took part. This was a slight drop from the previous Games. The disciplines were the same. On the ice rink, Ard Schenk was the great champion with three long-distance victories. Magnar Solberg retained his Biathlon gold, while Pål Tyldum won the 50 km.